The N.C. Department of Transportation announced Tuesday they have approved a $58.7 million contract to widen a 4.6-mile segment of N.C. 42 east of Clayton to alleviate growing congestion. W.C. English Inc. of Lynchburg, Va., can start after Oct. 29 on expanding the two-lane highway into four lanes with a raised median between Glen Laurel Road and Buffalo Road. Traffic should be using the new lanes by summer 2022. The median, which will redirect left turns from the side roads or business or residential driveways, will reduce the risk of crashes, especially the more dangerous angled collisions involving drivers going in opposite directions. 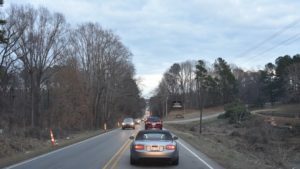 The extra lanes will improve traffic flow to an area of Johnston County that continues to see new residential and commercial development. • Adding two lanes in each direction along Interstate 40 between Exit 301 in Wake County and Exit 312 in Johnston County. The $360 million construction project, which was awarded in June, also includes rebuilding the I-40 and NC 42 interchange at exit 312 (NC 42 exit). • Widening NC 42 West between US 70 Business in Clayton and NC 50. The department plans to start construction in early 2022. This is one of 14 road and bridge projects the department recently awarded. The contracts went to the lowest qualified bidder, as required by state law. They are worth $507.7 million, which is $12 million under engineer estimates.